Christia Mercer: Reading gives people in prison hope. But some states want to take their books away. Christia Mercer Reading gives people in prison hope. But some states want to take their books away. My students, occupants of the Brooklyn Metropolitan Detention Center, had only just begun to settle into the semester when the prison went into lockdown in September 2017. For 12 days, MDC’s roughly 1,750 occupants were locked inside their cells, eating and defecating in their own little cages, some without the chance to shower. What did my students do during those grimy days of confinement? They read and re-read The Epic of Gilgamesh. The 15 of them had been admitted to the first Columbia University course taught in that facility, and their first major writing assignment for me was an analysis of the literary and philosophical elements of a poem so old that it had been written on clay tablets. Confined to their cells and meager belongings, my students found themselves luxuriating in the surreality of a 4,000 year-old story, while increasingly seeing themselves in the struggles of its heroes. They were amazed when violent combat between the god-man Gilgamesh and animal-man Enkidu yielded an intense friendship, and moved when Gilgamesh’s goddess-mother adopted Enkidu. After Enkidu’s ignoble death left Gilgamesh inconsolable, my students eagerly tracked his transformation from tyrannical warrior to wise leader. The incarcerated people I’ve taught over the years have been striving to become functioning members of our economy, contributors to their communities and examples to their children and friends. Books can only help with that; it’s counter-productive to restrict access to books for any of the 2.2 million incarcerated Americans who want them. Given the current nexus of illiteracy, criminal actions and high recidivism rates, we as a society should be doing everything we can to make books more easily available and encourage reading behind bars. But the opposite is true. 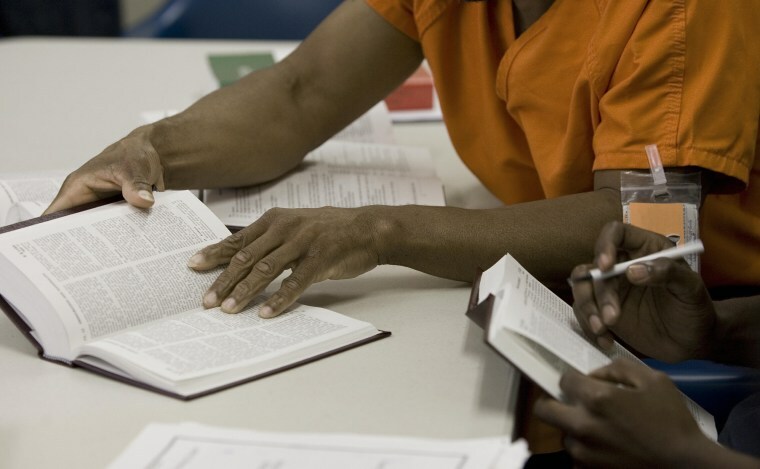 Access to reading materials and education is especially important because studies estimate that illiteracy rates in prison populations run as high as 75 percent. Literacy New York reports that nearly 85% of juveniles who face trial are functionally illiterate, “underscoring the relationship between illiteracy and crime." Given the current nexus of illiteracy, criminal actions and high recidivism rates, we as a society should be doing everything we can to make books more easily available and encourage reading behind bars. But the opposite is true: Access to books is becoming increasingly more difficult in U.S. prisons.In the name of safety, the New York State Department of Corrections and Community Supervision recently tried to stop a longstanding practice that allowed people in prison to receive packages of books from the outside. For decades, organizations like Books Through Bars have sent free books to prisons; thousands of packages of books are sent every year. Thankfully, Governor Cuomo responded to protests and suspended the program before its implementation. But his decision should not divert attention from the nationwide movement to curb prisoners’ access to books. People in solitary confinement, for example, are regularly stripped of the right to have access to library books. In Michigan, Connecticut, Alabama and many other states, corrections boards have banned hundreds of books; some Mississippi prisons have sent packages of books back to the non-profits that provided them; and Texas recently prohibited over 10,000 titles, including a collection of Shakespeare’s sonnets. Books matter and thinking about the ideas in books matters — especially to incarcerated men and women. Instead of restricting books, state correctional boards should do everything they can to make them as widely available as possible. According to a 2016 Marshall Project report, incarcerated people who don’t finish high school are 10 percent “more likely to be arrested again than those who got a high school diploma.” Yet, the more literate people become, the more likely they are to take high school prep courses and even college courses, which improve their prospects outside of prison and have been shown to reduce the likelihood of returning. Increased education has been shown to increase income and decrease crime rates, and other studies suggest that education for women with children is especially important as a means to promote success and “social capital” within family and communities. A National Research Council study further shows that, although 66 percent of incarcerated non-degree earners nationwide are likely to return to prison within three years of release, the likelihood drops to just 5.6 percent for Bachelor’s degree recipients. When the correctional officer led me into our classroom after those 12 days of lockdown last September, my students were already debating the transformative power of the relationship between Gilgamesh and Enkidu. A shy, youngish man began explaining that, like Gilgamesh, he had been an extremely wild youngster before befriending a young man who “calmed him down” and whom he dearly loved. Like Enkidu, his best friend died. He then confessed to a hushed classroom that he had never come to grips with the loss of his friend until he read the epic, saying quietly "that story is my life and reading it changed my life." We need all the working brains we can get. Books matter and thinking about the ideas in books matters — especially to incarcerated men and women. Christia Mercer is the Gustave M. Berne Professor of Philosophy at Columbia University and Director of the Center for New Narratives in Philosophy. She teaches in prison as part of Columbia’s Justice-in-Education Initiative. She has taught in Taconic Correctional Facility and the Brooklyn Metropolitan Detention Center. Christia Mercer is the Gustave M. Berne Professor of Philosophy at Columbia University and Director of the Center for New Narratives in Philosophy. She teaches in prison as part of Columbia’s Justice-in-Education Initiative, and has taught in Taconic Correctional Facility and Brooklyn Federal Prison.